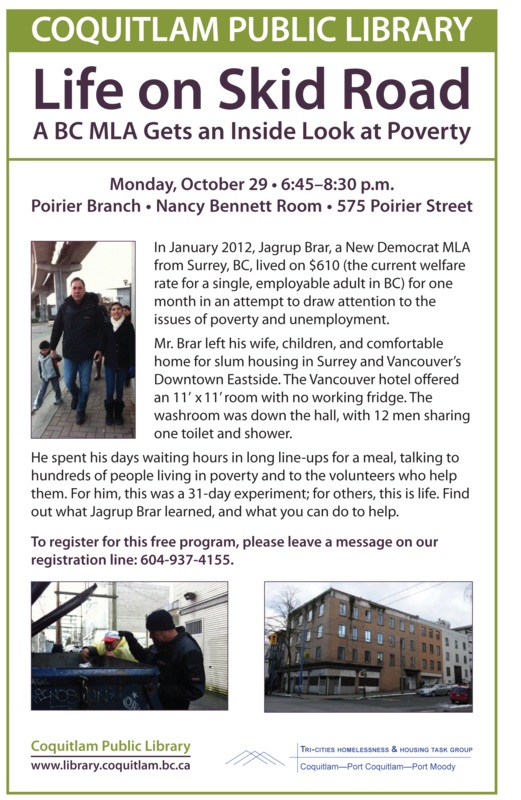 Jagrup Brar, Surrey MLA, will be speaking about his experience living on the equivalent of welfare for a period of one month in Surrey and the Downtown Eastside at the Poirier Branch of the Coquitlam Public Library on Monday, October 29th, from 6:45 – 8:30 PM. Jagrup’s intent was to draw attention to the issues of poverty and unemployment and during this period he heard the stories of many people who live this way on a full time basis. His narrative is compelling and thought-provoking. This event is a joint initiative of the Coquitlam Public Library and the Tri-Cities Homelessness & Housing Task Group. By tricitiestaskgroup in News on October 27, 2012 .